A round-up of all improvements and changes to the Buzz platform in version 2.0.84, available on January 5, 2017. 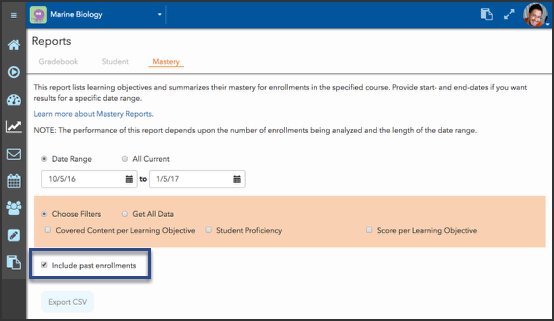 Teachers and admins can now include past enrollments in the reports they run. Simply check the Include past enrollments box. Fixed an issue that kept boolean default settings from showing up when editing metadata. Fixed a misspelling in a metadata dropdown list. Fixed an error that occurred when admins tried to delete objectives using a CSV file. Fixed an issue that kept admins from editing custom folder templates with only one item. Fixed an issue that kept custom Clipboard tabs from displaying properly when using numeric-only IDs. Fixed an issue that would cause a course copy to maintain and display objective mastery restrictions even when the new copy didn't include the specified objectives. Improved date picker popup behavior in the Editor. Removed Custom role from Bulk update options. Only allow whole numbers for Course days values. Fixed an issue that made Group Settings inaccessible in the Grade Editor when opened from the To-Do List. Updated sign-in functionality so that, when a user's login session expires and they are asked to sign in again when navigating to a Buzz page, they are automatically taken to that page after signing back in. Enhanced Editor to verify that valid numbers are being used when assigning possible points to questions and question banks.